The shutdown showdown is over after three days but will return in three weeks. The government shutdown was brief and while the impact on consumers was minimal the backlash on the democrats was stronger than expected. On Monday, they capitulated to allow the vote to extend government funding for three more weeks. The House passed the bill and President Trump signed it Monday night. Three weeks from now, we get to do it all over again. The stark difference in views between democrats and republicans on the illegal immigrant problem and the DACA expiration date on March 5th, is going to cause another stalemate. While an agreement is possible, the chances are very high for another shutdown. Between now and then we have the State of the Union speech. There is likely to be a few words directed to the immigration problem and that is going to stir the cauldron of hostility between opposing sides in the house and senate. If there is another shutdown will the market result be the same? Three weeks from now a lot of companies will have reported and we will be in the post earnings depression phase of the cycle. The pre-earnings excitement will have passed and investors will be taking profits. That could make the market impact from another shutdown more visible. Secondly, if there is another shutdown, it may be prolonged. That could weigh on the market as well. If you blinked at the open on Monday you missed the market impact. The major indexes were only down slightly and very briefly. As soon as it was evident the shutdown was going to end, the market took off again and closed at new highs. It will be interesting to see if the result is the same if we have a repeat event. Historically, the market almost always rebounds from government shutdowns. The problem is in the past, there were no major political events and the coast is clear. 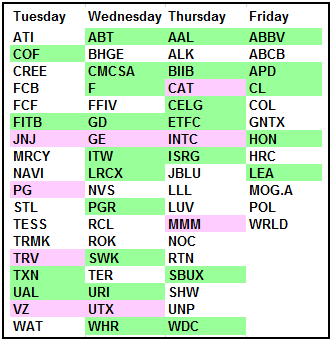 The calendar for the rest of the week is busy but there is nothing that should move the market. The new and existing home sales will tell us the housing market is still doing fine. The three regional Fed economic reports will tell us the economy is still improving. 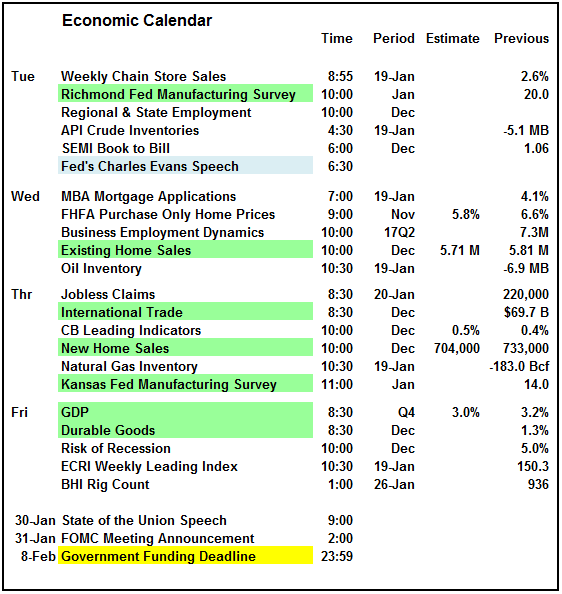 The GDP is the biggest headline for the week. If it comes in over 3% it will be the first time we had three consecutive quarters of 3% growth since 2005. The president will be sure to tout that in his tweets and there will be a lot of talk among market commentators. Future estimates are sure to rise given the impact of the tax reform. There are eight Dow components reporting earnings this week and another similar number next week. There are only a couple big cap tech stocks this week with the majority next week. Netflix reported after the bell today and gained $20 in afterhours. Intel reports on Thursday. 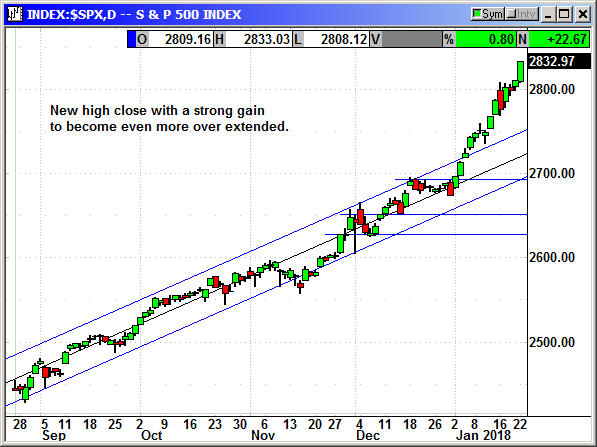 The S&P posted a strong 22 point gain on Monday and given the recent three week streak of gains that is even more impressive. It is hard not to think about the euphoria phase that normally ends big market gains. With the S&P up 158 points (6%) in just three weeks and closing in on the median forecast for year-end at 2,855, this suggests euphoria is increasing. The index is well above initial support at 2,750 although we did have some light support form at 2,795 last week. Any material bout of profit taking is going to be painful. Today was a record day for this streak. It has been 395 trading days since the S&P had a 5% correction. That is the longest streak in history. There has been one -3.1% decline in that same period. We normally have one 10% drop and two 5% drops per year. We are definitely overdue. 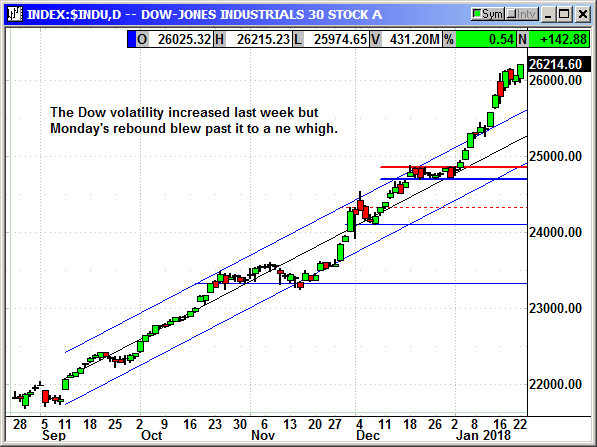 The Dow was looking top heavy last week and the multiple days of increased volatility with back to back 300 point reversals, was a strong warning signal. Today's calm move to a new high erased those concerns and the VIX fell back to 11. That is still elevated from the 2017 levels but still low on a historical basis. The Dow now has support at 26,000 and after last week's pause, it could move higher. However, there are 8 Dow components reporting earnings this week and that could generate some new volatility. 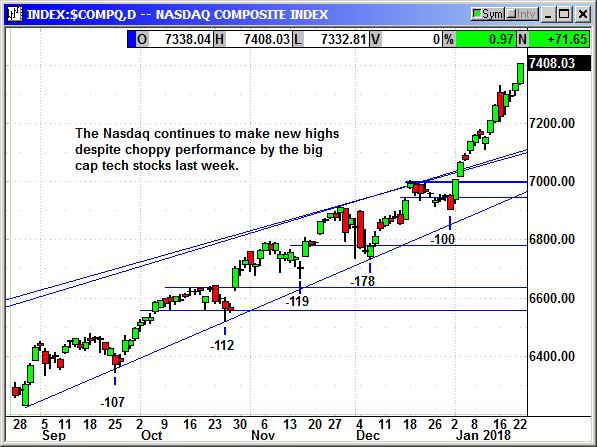 The Nasdaq is streaking higher and has not paused since breaking across 7,000 on January 2nd. 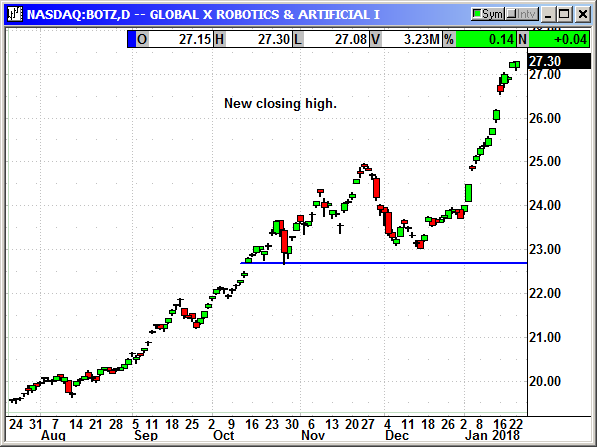 The index appears to be unstoppable but it has broken with its prior trend of profit taking every 2-3 weeks. We are now into the fourth week of gains and it is getting stronger instead of weaker. This is another example of rising euphoria. 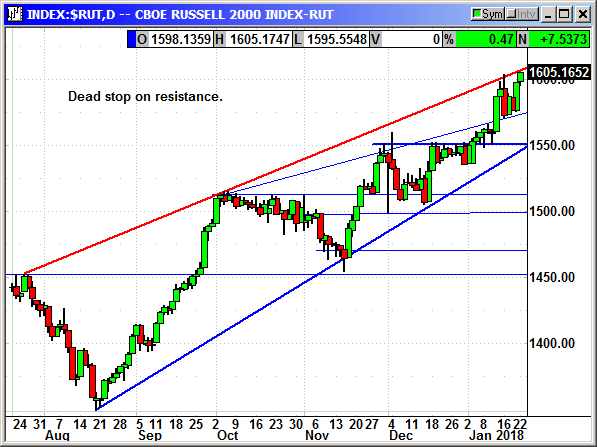 The Russell closed at a new high but with a dead stop on resistance. This week will be a real test for the Russell because the small caps should benefit greatly from the tax reform. They could punch through this resistance and take back their leadership role but I am not holding my breath. That is going to be tough to break. I believe the markets will continue to creep higher over the next two weeks but then run into trouble in the first full week of February. Earnings will be mostly over and the outcome will be chiseled in stone and priced into the market. The post earnings depression cycle will be in full swing and the market could turn rocky for the month of February. After February I believe we will ramp back up into Q1 earnings and the hundreds of announcements of higher dividends and bigger stock buybacks. The messy Q4 guidance will be behind us and Q1 guidance should be very positive. I would continue to buy the dips for the next couple weeks but then turn cautious as the calendar turns to February and the next government funding deadline arrives on Feb 8th. In late November, DLTR reported earnings of $1.01 that beat estimates for $90 cents and was well above the 70 cents reported in the year ago quarter. Revenue of $5.32 billion beat estimates for $5.28 billion. For the current quarter, they guided for revenue in the range of $6.32-$6.43 billion and analysts were expecting $6.26 billion. Full year earnings guidance was $4.64-$4.73 and $22.2-$22.31 billion. That is up from $4.44-$4.60 in prior guidance. Analysts were expecting $4.69. Same store sales (SSS) for the system rose 3.3% and beat estimates for $2.4%. Dollar Tree SSS rose 5.0% and Family Dollar sales rose 1.5%. Next earnings Feb 20th. After earnings, Moffett Nathanson initiated coverage with a buy. A week ago Guggenheim initiated coverage with a buy rating and $125 price target. Dollar Tree is Amazon proof. With everything in the store $1 or less even Amazon cannot sell and ship items that cheap. Since their acquisition of Family Dollar they now operated 14,334 stores. This is a retail powerhouse and even if the economy weakens, their business will thrive because of the low price point. We had a great run on DLTR in Q4 for a $1,700 gain. We close the position on Jan-2nd when momentum slowed and shares declined several days in a row. The Guggenheim buy rating saw the shares spike from $110 to $115 and then traded sideways to down for a week as traders took the unexpected profits. 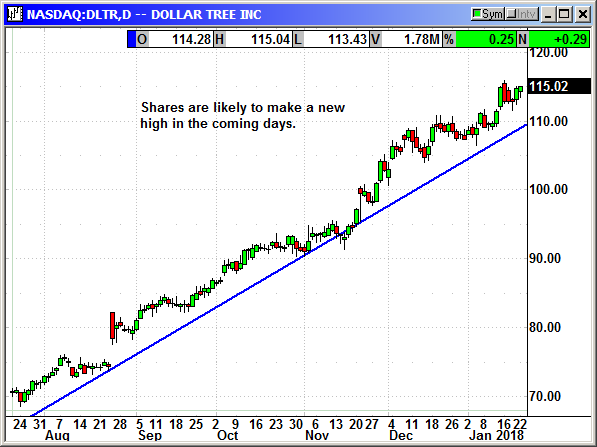 Retailers across all sectors are surging again and I believe DLTR is going to break out to a new high. Buy March $120 call, currently $3.20, initial stop loss $111.50. The long call position was entered at the open on Monday. No specific news. 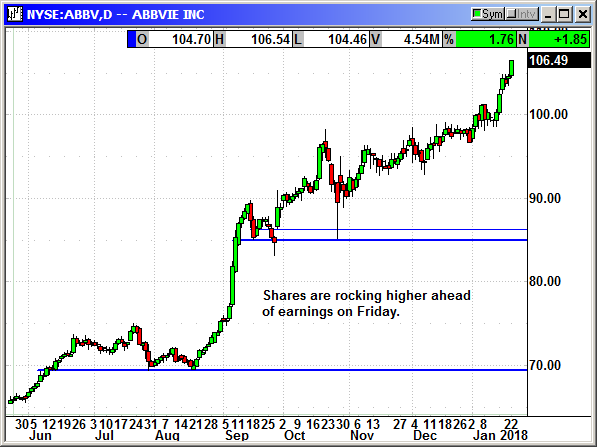 ABBV has earnings on Friday so we need to close this position on Thursday at the open. Original Trade Description: November 6th. Next expected earnings January 26th. ABBV reported earnings of $1.41 that beat estimates for $1.39. Revenue of $7 billion missed estimates for $7.04 billion. They raised full year guidance from $5.44-$5.54 to $5.53-$5.55. They guided for 2018 earnings of $6.37 to $6.57. Analysts were expecting $5.53 for 2017 and $6.56 for 2018. The company raised its quarterly dividend by 11% to 71 cents. AbbVie previously guided for sales of Humira to exceed $18 billion in 2020. In their earnings call they raised that guidance to $21 billion in 2020. Sales of Humira hit $4.7 billion in Q3 to put it on track for $18 billion two years earlier than prior guidance. That is just one drug. At the same time, they are projecting non-Humira sales to reach $35 billion in 2025. That is a risk adjusted assumption that some drugs will fail in trials. Without any failures they are projecting $47 million. The risk-adjusted number would put AbbVie in 9th place by revenue. The nominal number would put them in fifth place. The company recently announced a deal with Amgen to resolve patent problems on Humira and push biosimilar competition well into the future. The company's confident that there would not be a biosimilar drug until 2021-2022 matched analyst estimates. This is a steep uphill battle for anyone trying to copy this drug. In September AbbVie filed two new drug applications with the FDA and reported positive results on two drug trials. Shares have gained $12 in a week. On Monday, they reported studies on rheumatoid arthritis with the drug Upadacitinib had met all primary and secondary endpoints. In testing two different doses 40% of patients reported clinical remission after 12 weeks and 50% reported the same after 24 weeks, without any unforeseen side effects. These were patients that had failed to respond to conventional treatments. More than 23 million people are afflicted with this disease. This will be a blockbuster drug for AbbVie and they have many more in the pipeline. The company received a favorable opinion on MAVIRET, a once daily Hep-C drug, from the European Medical Agency and the CHMP. This is an 8-week cure for Hep-C that will compete with Gilead's products. Analysts claim AbbVie's pipeline is the strongest in the industry. The post earnings drop is a buying opportunity and shares are rebounding. The company's other drugs are going to be cash cows. Imbruvica generated $1.8 billion in sales in 2016 and could reach $7 billion annually over the next couple of years. Venclexta was approved in 2016 for leukemia and sales could peak at $3.5 billion a year. An experimental cancer drug called Rova-T could hit $5 billion a year when approved. A psoriasis drug called risankizumab could produce $4 billion a year and arthritis drug upadacitinib could peak at $3.5 billion. Update 11/27: AbbVie was just notified that one of its groundbreaking lymphoma drugs had been accepted as a late-breaking abstract at the American Society of Hematology conference in early December. In all, the company will have a total of 28 abstracts presented across various hematologic malignancies. The conference if Dec 9-12th and should generate some positive headlines for the company. Update 12/4: AbbVie said a phase 3 trial of its plaque psoriasis treatment, risankizumab, met all co-primary and ranked secondary endpoints. The company said no new safety signals were detected. "With a significant portion of risankizumab patients achieving high levels of skin clearance, these results add to the data supporting risankizumab's potential to be an impactful new treatment option for patients living with psoriasis. Shares tried to rally but the biotech sector was crashing with the Nasdaq. Update 12/11: AbbVie said a phase 2 trial of Imbruvica, showed positive results for cGVHD after stem cells or bone marrow transplants. They also reported positive results for the same drug on Mantle Cell Lymphoma and chronic Lymphocytic Leukemia. The drug still has additional testing but it appears to be on track for successful adoption in various therapies. Long Feb $95 call @ $3.75, see portfolio graphic for stop loss. No specific news. Shars are powering higher to close at a 2-month high. Autodesk, Inc. operates as a design software and services company worldwide. It operates through Architecture, Engineering, and Construction; Manufacturing; Platform Solutions and Emerging Business; and Media and Entertainment segments. The company offers AutoCAD, a professional design, drafting, detailing, and visualization software; and AutoCAD LT, a professional drafting and detailing software; Maya and 3ds Max software products that offer 3D modeling, animation, effects, rendering, and compositing solutions; and Revit software for building information modeling. It also provides Inventor tool for 3D mechanical design, simulation, analysis, tooling, visualization, and documentation; AutoCAD Civil 3D, a surveying, design, analysis, and documentation solution for civil engineering, including land development, transportation, and environmental projects; and computer-aided manufacturing (CAM) software for computer numeric control machining, inspection, and modelling for manufacturing. In addition, the company offers Fusion 360, a 3D CAD, CAM, and computer-aided engineering tool; BIM 360, a construction management software; and Shotgun, a cloud-based software for review and production tracking in the media and entertainment industry. It licenses or sells its products to customers in the architecture, engineering, and construction; manufacturing; and digital media, consumer, and entertainment industries directly, as well as through resellers and distributors. Autodesk, Inc. was founded in 1982 and is headquartered in San Rafael, California. Company description from FinViz.com. Autodesk was flying high in November at $130 but fell off a cliff after earnings. Shares plunged to $105 on weaker than expected subscriber additions. Autodesk is converting from the software sales model to the software as a service model with various subscription plans. This will produce steady earnings in the future but it normally rocky in the first two years of conversion as we have seen with a dozen other companies. The company reported a loss of $119.8 million on revenue of $515.3 million. Analysts were expecting $116.4 million and $513.6 million. There was nothing in those numbers that would have caused a $25 share drop. They reported 146,000 new subscribers and analysts were expecting 147,000. The company slightly lowered the full year subscriber forecast because of the minor miss. The company said the reason for the miss was a large number of new enterprise customers. These customers buy companywide licenses for extended periods compared to the 2-3 license subscriptions in smaller companies. The bigger deals sharply raised the unbilled deferred revenue from $63 million to $148 million. William Blair said this was the first quarter of YoY revenue growth since April 2015. Morgan Stanley also said not to worry about the subscriber numbers because the enterprise customers were "higher value" subscribers. The company also announced a cutback of 1,000 jobs in a previously unannounced restructuring. Morgan Stanley things that will yield about $6 per share in free cash flow in 2020. I believe the restructuring is going to be positive. Basically, they said they were going to shutdown all the noncore operations and simply focus on making the core business better. I believe they grew too fast and prior management was spreading the effort into other areas that would not be highly profitable. The new management said, focus on the profitable areas and trim the costs and other efforts. 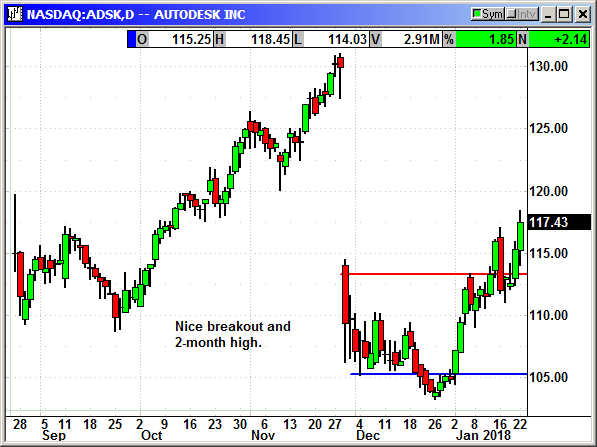 ADSK shares have moved sideways for the two weeks after the initial drop. We entered a position in ADSK on Dec 5th but were stopped on Dec 20th when shares briefly broke below support. Shares are rising again and I want to reenter a positin. The options are expensive so I am going to recommend a spread. I believe the stock will ramp into earnings and then it is a coin toss for direction. We will exit before the Feb 27th earnings. Long March $120 call @ $4.19, see portfolio graphic for stop loss. Short March $130 call @ $1.45, see portfolio graphic for stop loss. No specific news. Continuing to rally with the market and the chip sector. The ETF is somewhat slow moving since it just began trading in September. Volume has increased significantly to 2.59 million shares on Monday. The key to this ETF and this position is that the stock rarely goes down and the options are cheap. There have only been 3 periods of decline in 2017 and each drop was only about 60 cents. The ETF is rising steadily since April but has recently been accelerating. If this continues, even allowing for some declines, that would equate to a nice gain by June and the option costs $1.45 at the money. This is not going to set the world on fire like a Facebook or Netflix but it should be dependable, stable gains. Obviously, past performance is no guarantee of future results. Long June $24 call @ $1.45. See portfolio graphic for stop loss. No specific news. 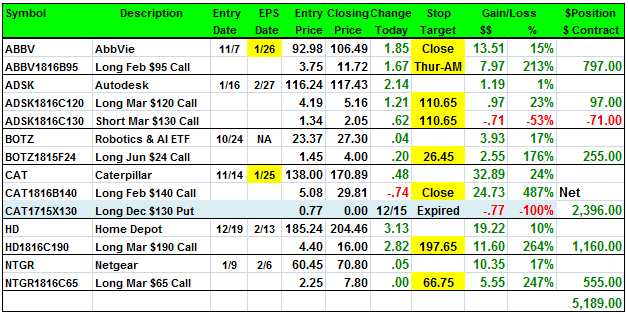 Earnings are Jan 25th and we have to exit at the open on Tuesday. There are too many factors that could cause CAT shares to fall in the two days before earnings. We had a great run! Shares have flat lined over the last week suggesting investors are worried about a potential disappointment. Caterpillar Inc. manufactures and sells construction and mining equipment, diesel and natural gas engines, industrial gas turbines, and diesel-electric locomotives for heavy and general construction, rental, quarry, aggregate, mining, waste, material handling, oil and gas, power generation, marine, rail, and industrial markets. Its Construction Industries segment offers backhoe, compact, track-type, small and medium wheel, knuckleboom, and skid steer loaders; small and medium track-type, and site prep tractors; mini, wheel, forestry, small, medium, and large track excavators; and motorgraders, pipelayers, telehandlers, cold planers, asphalt pavers, compactors, road reclaimers, and wheel and track skidders and feller bunchers. The company's Resource Industries segment provides electric rope and hydraulic shovel, landfill and soil compactor, dragline, large wheel loader, machinery component, track and rotary drill, electronics and control system, work tool, hard rock vehicle and continuous mining system, scoop and hauler, wheel tractor scraper, large track-type tractor, and wheel dozer products; longwall, highwall, and continuous miners; and mining, off-highway, and articulated trucks. Its Energy & Transportation segment offers reciprocating engine powered generator set and engine, integrated system, turbine, centrifugal gas compressor, diesel-electric locomotive and component, and other rail-related products and services. The company's Financial Products segment offers finance for Caterpillar equipment, machinery, and engines, as well as dealers; property, casualty, life, accident, and health insurance; and insurance brokerage services, as well as purchases short-term trade receivables. It's "All Other" operating segments provides parts distribution and digital investments services. The company was formerly known as Caterpillar Tractor Co. and changed its name to Caterpillar Inc. in 1986. Company description from FinViz.com. The global economy is rebounding. There are massive construction projects now underway in China and Asia. The Eurozone is also seeing a resurgence in consrtuction. Commodity metals are booming and mines are reopening shuttered capacity and opening new mines. Everything is suddenly positive for CAT and guidance is exploding. In December they guided for full year 2017 revenues of $38 billion "as a reasonable midpoint expectation." Analyst estimates for earnings of $3.25 were "too optimistic" according to CAT. In January they guided for $36-$39 billion in revenue and $2.90 in earnings. In April they guided for $38-$41 billion in revenue and $3.75 in earnings. In July they guided for $42-$44 billion in revenue and $5 in earnings. In October they guided for $44 billion and $6.25 in earnings. In April they guided for revenue from construction at flat to 5%. In July they guided for 10% to 15% growth. In October they guided for 20% construction growth. In April they guided for revenue from mining at 10% to 15%. In July they guided for 20% to 25% growth. In October they guided for 30% growth in mining. In April they guided for energy revenue at flat to 5%. In July they raised it to 5% to 10%. In October they raised it to 12%. At the September 12th investor day meeting the new CEO said they were targeting $55 billion in revenue in 2018 with margins of 14%-17% compared to 12% in 2017. That would take them back to 2014 levels before the bear market in commodity/energy began. That is 28% above 2017 levels. He was careful not to call it a target but said that level was achievable if the current rebound in mining, energy and construction continued. In late September, CAT reported a global increase in machine sales of 11% for August. Total sales in Asia and the Pacific surged 44%. In their October earnings, they said Asia-Pacific revenue spiked 57%. After the devastation in Houston, there were new estimates from analysts for 17% or higher revenue growth in construction equipment. 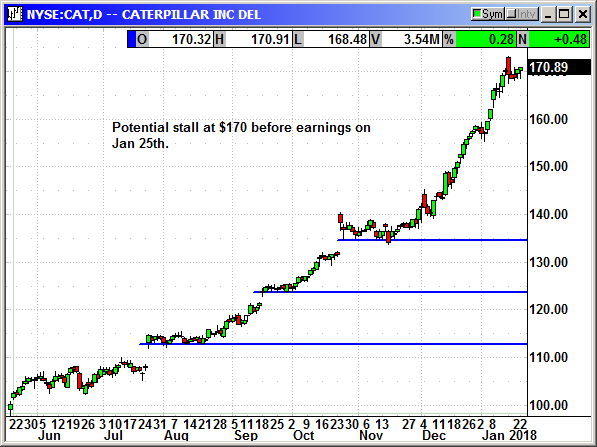 In late October Caterpillar (CAT) reported earnings of $1.95 that nearly quadrupled and blew past estimates for $1.22. That is the kind of earnings beat that should have spiked shares but given CAT's recent string of new highs over the last three months, a lot of excitement was already priced into the stock. Revenue rose 25% to $11.41 billion compared to estimates for $10.61 billion. Construction equipment revenue rose 37% with energy and transportation equipment revenue rising 12%. CAT raised guidance for the full year from $5.00 to $6.25 on revenue of $44 billion. Analysts were expecting $5.29 and $42.94 billion. This was a killer quarter for CAT and this confirms more than anything else that the global economy is beginning to surge. CAT shares surged to $140 on the earnings. Over the last three weeks the Dow has been moving sideways and so has CAT. Despite the intraday dips in the Dow CAT continues to hold at $136. If the Dow takes a cliff dive over the next couple of weeks, CAT will follow but the 30-day average is $133 and that has been support. I am recommending we buy a December $130 put to hedge against a sudden decline. Lastly, the S&P futures are negative tonight. If the market opens lower DO NOT enter this position until CAT shares are positive, even if it takes a couple of days. I would rather buy a dip if possible. Update 12/18: CAT announced a quarterly dividend of 78 cents payable Feb 20th to holders on Jan 22nd. CAT has raised its dividend for 24 consecutive years and has paid quarterly dividends since 1933. The company said sales rose 26% for the three months ending in November. Asia Pacific sales rose 43%, Europe, Africa and the Middle East rose 32%, North America rose 12%. Latin America sales rose 48% in October. No number was given for November. Long Feb $140 call @ $5.08, see portfolio graphic for stop loss. Closed 12/15: Long Dec $130 put @ 77 cents, expired, -.77 loss. No specific news. 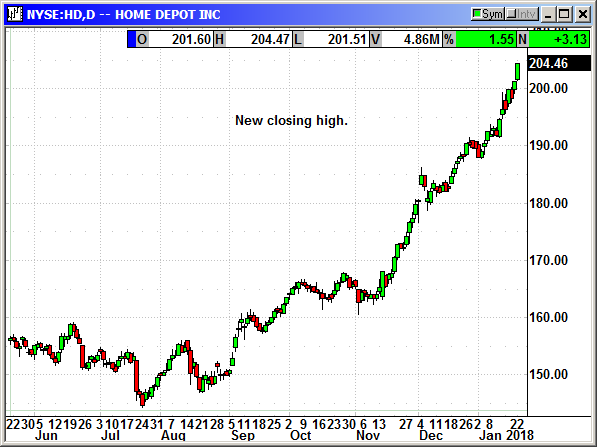 HD shares continue to set new highs despite being very overbought. I am tightening the stop loss again. Earnings are Feb 13th and I would plan to hold over that report because they will give tax guidance at that time. Update 1/1/18: HD is reportedly talking to XPO Logistics about an acquisition of the $9 billion company. HD uses them to deliver large items like refrigerators and other appliances. There could be a battle with Amazon since that large item shipping is a problem for Amazon. Long Mar $190 call @ $4.40, see portfolio graphic for stop loss. No specific news. Guggenheim reiterated a buy rating and raised their price target to $76. The analyst said sales of Arlo cameras, Orbi Wi-Fi routers are surging and the company would get a boost from the lower tax rate. These products and others have opened a new revenue stream of subscription services. Two weeks ago Amazon bought Blink. You may not have heard about Blink but they launched in 2016 with an inexpensive wireless camera and video doorbell. This is the hot new sector for video surveillance. You have probably heard about Ring video doorbells, which is a different company. Facebook could find a way to use the Arlo system and that would be a significant branch away from their social media roots. I doubt they would want the networking business. 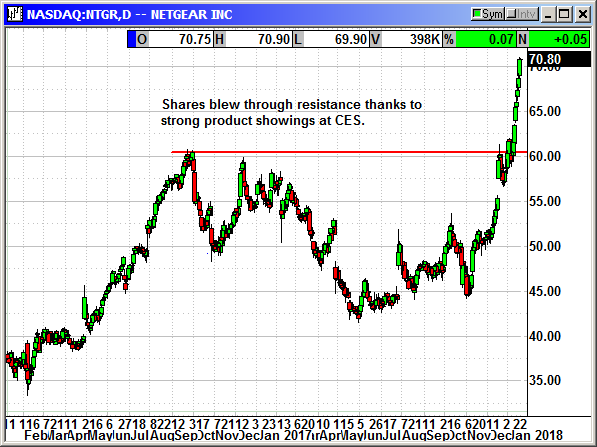 In reality, nobody has to buy Netgear for them to succeed. They are already successful and Arlo is an entirely new category for them and a category that is exploding in sales. When they report Q4 numbers they could be very high. Shares spiked to $60 in mid December and traded sideways for the last three weeks. I believe shares are about to move higher. Update 1/16/18: Netgear demonstrated new products at the CES show and the crowd loved them. Apparently, so did investors. They announced the Nighthawk Pro Gaming system of network gear that will cut lag time and enhance multiplayer game play for serious gamers. They also demonstrated the Orbi Wi-Fi system, which has also been very successful. With the rapid ramp of the Arlo video cameras for security, they have completed an entire cloud support system that allows storage of video, multiviewer capability for home monitoring, etc. Long Mar $65 call @ $2.25. see portfolio graphic for stop loss.